My twentieth ground of 2015 was on Tuesday 27th October at Goodison Park in Liverpool, Merseyside. The match was Everton vs. Norwich City in the Football League Cup 4th Round. Goodison Park is located in a built-up residential area in the Walton area of the city, close to Stanley Park. The venue is three-quarters of a mile east of the nearest railway station at Kirkdale and around 2.5 miles north of Liverpool Lime Street station in the centre of the city. 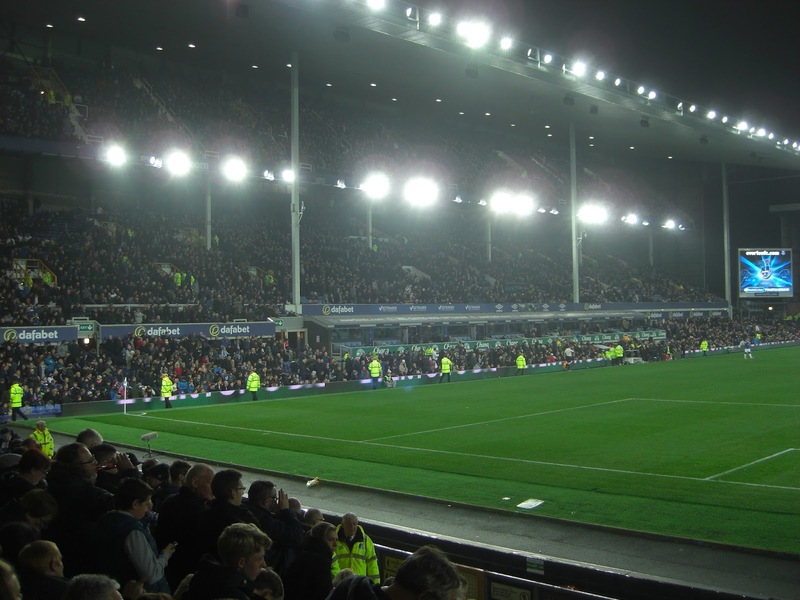 Goodison Park has been home to Everton since 1892 making it one of the oldest top-flight grounds. With the stadium surrounded by residential streets on three sides it is quite tightly packed in except on the south side where there space for the club to utilise. This area is marked with a statue of Dixie Dean and a memorial wall gated entrance. Inside is a fan zone with food outlets and a small club shop (the main Everton One club shop is located just across the road). 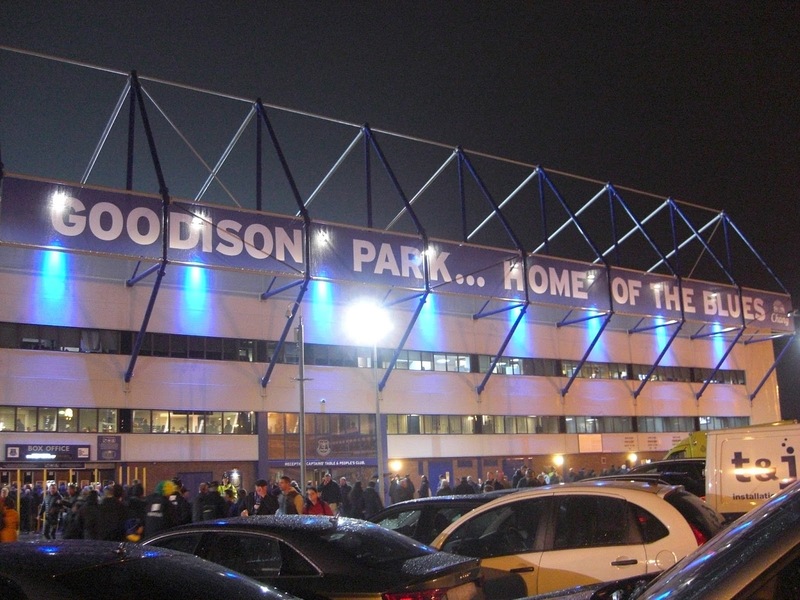 The southern end is home to the Park End - the most recent addition to Goodison Park having been built in 1994. This single-tier cantilever stand can fit approximately 6,000 fans and also includes the club reception, ticket office and hospitality areas. Because of its newer design it is the only stand in Goodison Park with no restricted views. On the western side of the ground is the Main Stand which is the only three-tier structure. This was built in 1971 and towers over the other three stands which are of the same height. There are great supporting beams holding up the roof at the bottom of the second tier with smaller stanchions at the top to hold up the top tier. Since its opening the Main Stand has had corporate boxes added to the small bottom tier. Opposite this is the Bullens Road Stand which dates back to 1926. This includes a large gantry at the top of the stand where the TV camera is positioned. The southern end of the stand is given over to away fans with large following using the top and bottom tiers. There is a corner quadrant which links this Gwladys Street Stand behind the northern goal. Originally built in 1938 this end has undergone quite a lot of change over the years that followed. 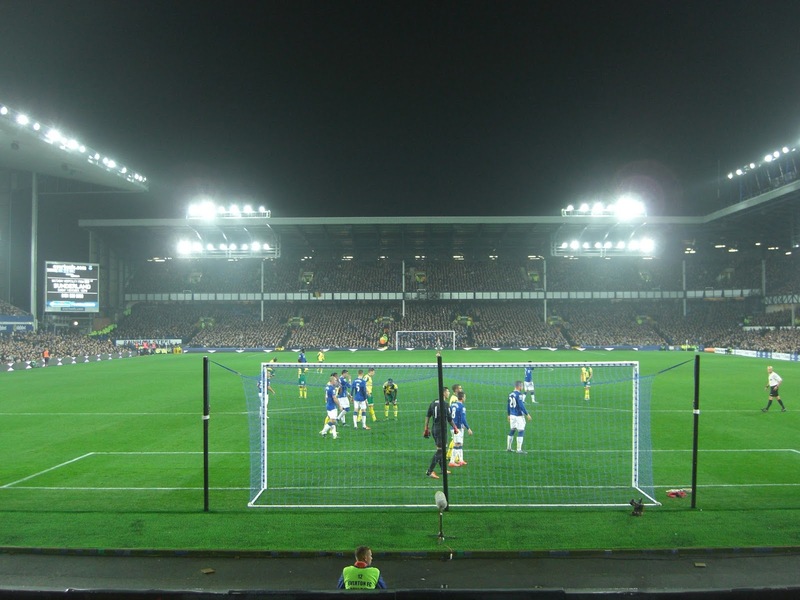 There is no quadrant linking it up with the Main Stand due to the church in the north-east corner of Goodison Park. With no more room to increase the current capacity of 39,572 and the small amount of corporate areas afforded to it the club have had their eye on building a new stadium for quite some time. However, after several false starts this will be a number of years before this may come to fruition. The first half was a dull affair - the closest either side came to netting was in the 25th minute when Tyias Browning intercepted the ball and slid it through to Romelu Lukaku who brought a good save out of Declan Rudd. Only 5 minutes into the second half Norwich took the lead - a corner was only cleared as far as Gary O'Neil who scooped the ball back into the box allowing Sebastian Bassong to stroke the ball home. The hosts had plenty of possession during the following minutes but found it tough to create good chances until the 68th minute when they netted the equaliser. Kevin Miralles got into space down the left-wing and his low cross found Leon Osman who turned and rolled the ball in off the post. The away side had a few good opportunities to win it after this but were denied by some excellent goalkeeping by Joel Robles. The game progressed into extra time with Everton the better side but in injury time Ross Barkley blazed over to ensure this one was going to a penalty shoot-out. Everton successfully dispatched their spot-kicks but with Wes Hoolahan and Nathan Redmond failing to score it meant an exit from the tournament for Norwich.